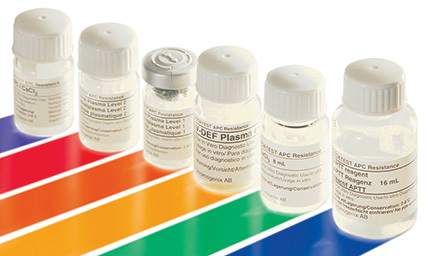 Chromogenix Coatest® APC™ Resistance – V is an APTT-based assay kit for the screening of factor-V-related APC resistance. The high sensitivity and specificity of the test for the factor V:Q506 mutation is obtained by prediluting the sample plasma with an excess of V-DEF Plasma bioreagent. The test design makes it possible to discriminate between heterozygous and homozygous factor V genotypes. It also allows for analysis of plasma from patients on heparin or oral anticoagulant therapy. High discrimination between genotypes with 100% sensitivity for FV:Q506. Reduces need for PCR determination. Applicable to anticoagulant treated patients. 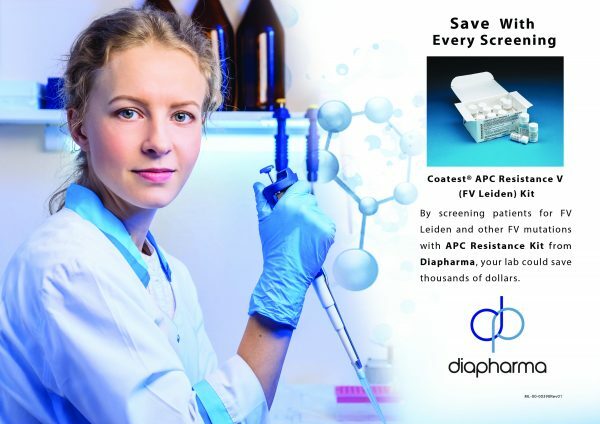 A time- and money-saving alternative to individual genetic testing, Coatest© APC™ Resistance testing is an ideal solution for physicians and labs. 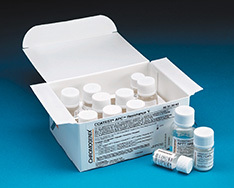 Each kit was designed to be easy to use for in-house screening, offering fast results and low costs for both large- and small-volume labs. The most common FV Leiden screening test performed, it offers unmatched sensitivity for the FV:Q506 mutation – close to 100% specificity – and is applicable to patients on heparin or warfarin. One volume of plasma is prediluted with four volumes of V-DEF Plasma. The dilution is then incubated with the APTT reagent for a standard period of time. Coagulation is triggered by the addition of CaCl2 in the absence and presence of exogenous APC and the time for clot formation is recorded. Activated Protein C (APC) is a regulator of the coagulation cascade, by specifically inactivating factors Va and VIIIa, in the presence of phospholipids and calcium. In most of the cases (more than 90%), Activated Protein C Resistance (APCR) phenotype is caused by a Factor V gene mutation (Factor V Leiden). The mutation, located on Factor V exon 10 (1691 G –> A), of arginine to glutamine on position 506, renders Factor Va resistant to the cleavage by Activated Protein C. This genetic anomaly can be evidenced with a clotting method performed in the presence or the absence of Activated Protein C.
The Chromogenix Coatest APC Resistance V method was used for analysis of plasma from various sample categories showing discrimination between normal and mutated factor V genotypes. Activated Protein C (APC) is a regulator of the coagulation cascade, by specifically inactivating factors Va and VIIIa, in the presence of phospholipids and calcium. In most of the cases (more than 90%), Activated Protein C Resistance (APCR) phenotype is caused by a Factor V gene mutation (Factor V Leiden). The mutation, located on Factor V exon 10 (1691 G –> A), of arginine to glutamine on position 506, renders Factor Va resistant to the cleavage by Activated Protein C. This genetic anomaly can be evidenced with a clotting method performed in the presence or the absence of Activated Protein C.
Activated Protein C Resistance is tested by using a clotting method performed with or without Activated Protein C.